Last night I took my tween to see Divergent.... If you can believe it, her English class was required to read the book. Now this coming off of the heels of the second Hunger Games - Catching Fire, she soaked up the book like a sponge and is quickly making it to the end of the 2nd book Insurgent. Stating "Mommy, I feel so bad...I think I like this book so much better than the Hunger Games", (the trilogy she has yet to make it through the second book before putting it away and never picking it up again). So last week I secretly went ahead and purchased tickets. She thought she was going to have her teeth cleaned. Hee Hee. I know I'm a terrible mommy! When she found out where we were going...she told me I was the best mom EVER!" Then she hugged me so tight and wouldn't let go! Anyway, I had only read through the first couple of chapters of Divergent before seeing the movie. So I knew just a little bit of the concept, but really had no true idea of what the movie was about. For my child, who is quite sensitive, it was a roller coaster ride of emotions. Smiling, giggling, crying, beaming, and excitement, not exactly in that order. I don't want to give the movie away but I can tell you my child held her parents hands at certain points with full emotional tears through a couple of scenes in the movie. She relates many things on screen to her own life and found these scenes extremely emotional and sad. At one point, I welled up as well. I have to say, if she didn't have to read the book in class, traditionally I would have seen the movie first before letting her watch it. And most likely she would have seen it on DVD at home. It does have some scenes in it that parents may wish to review first. Anyway, I sat there within the first half hour of this movie, rummaging through the storage files in my mind on where I've seen the male lead before. I racked my brain, but just couldn't come up with it. So you know I was turning to Google on the way home, right? I don't even think we were out of the parking garage before I was searching. Turns out, this guy, Theo James, who plays Four, also played in Downton Abbey! Holy cow, who knew? Well, I guess everyone else but me. I don't get out much, you know. For those of you who live in my "under the rock community" he played Kemal Pamuk. You know! The guy who dies in Lady Mary's bed? Lady Mary played by Michelle Dockery? The one who made his entrance and exit all in one episode, but continued to dominate the story line all the way up through season 4? Yeah! That one. I KNOW, right? Downton Abbey Season 1 Episode 3. 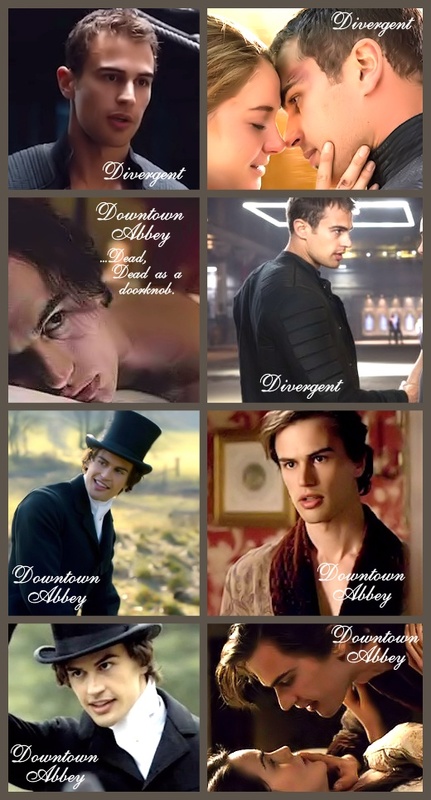 If you've forgotten even in the least, or just want to peek at him some more, here's some eye candy for you both Downton Abbey and Divergent Fans or just plain Theo James Fans....ENJOY!